Effie M. was a monster. Six foot high and as strong as a farm horse. No sooner had she decided that she wanted Uncle Tom than she knocked him off his bicycle and told him. I was set down from the carrier’s cart at the age of three; and there with a sense of bewilderment and terror my life in the village began. Such a morning it is when love leans through geranium windows and calls with a cockerel’s tongue. 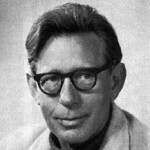 Laurie Lee was an English poet, novelist and screenwriter, who was brought up in the village of Slad and went to the Central Boys' School, Stroud, Gloucestershire. His most famous work was an autobiographical trilogy which consisted of Cider with Rosie, As I Walked Out One Midsummer Morning and A Moment of War. The first volume recounts his childhood in the Slad Valley.